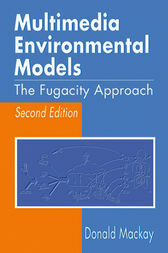 Completely revised and updated, Multimedia Environmental Models: The Fugacity Approach, Second Edition continues to provide simple techniques for calculating how chemicals behave in the environment, where they accumulate, how long they persist, and how this leads to human exposure. The book develops, describes, and illustrates the framework and procedures for calculating the behavior of chemicals in our multimedia environment of air, water, soil, and sediments, as well as the diversity of biota that reside in these media. While other books focus on specific compartments, such as the atmosphere, or specific substances, such as PCBs, this book presents the big picture of how organic chemicals behave in the total environment. It does this by providing examples of calculation methods based on the fugacity approach and explaining how to access up-to-date property databases and estimation methods as well as computer programs, which are available from the Internet. In addition, the models are Web based, instead of on a floppy disk as in the previous edition. When you need to make assessments of chemical behavior you need current, comprehensive. Multimedia Environmental Models: The Fugacity Approach provides you with not only an understanding of how the multitude of organic chemicals behave in the total environment, but also with practical examples of how this behavior can be predicted using the fugacity approach.